The authors’ analysis, however, suffers from a number of data and methodological problems that bias the study in the direction of finding job loss, even where there may have been no job loss at all. One initial indicator of these problems is that the estimated employment losses in the Seattle study lie far outside even those generally suggested by mainstream critics of the minimum wage (see, for example, Neumark and Wascher )—as the authors themselves acknowledge. The employment responses estimated by the authors are well outside the bounds of most published research, and indeed all of the research cited by the authors implies much smaller and even no employment changes in response to wage increases similar to those experienced so far in Seattle. After accounting for Seattle’s much higher wage structure, the increase of the minimum wage to $13.00 in the city is within the range of increases that other research has found to have had little to no effect on employment. The study implausibly finds employment changes due to the minimum wage in parts of the labor market where there should have been none. The study’s own estimates inaccurately imply the minimum wage caused large gains in the number of jobs paying above $19.00 per hour and in the number of hours worked in those jobs—even though those jobs are well above the wage range where the $13.00 minimum wage should be having measurable effects. These spurious results strongly suggest that the study’s methodology fails to account properly for the booming Seattle labor market during the period being studied—a labor market that has been shifting employment from lower-paid to higher-paid jobs. The study excludes an important group of workers, representing roughly 40 percent of the workforce: those working for employers with businesses in multiple locations. By omitting all multi-location businesses, such as chains, in Seattle, the authors bias their results toward showing job loss if there has been a shift in employment from small, single-location establishments toward larger firms with multiple locations. The study’s findings of employment losses well outside even those generated by a large body of earlier research raises immediate concerns about the study’s methodology. The exclusion of roughly 40 percent of employment from the analysis—especially when multi-site employers are large employers of low-wage workers and may be expected to increase their share of low-wage employment after a minimum wage increase—is a major limitation of the study and one that will be difficult to circumvent. 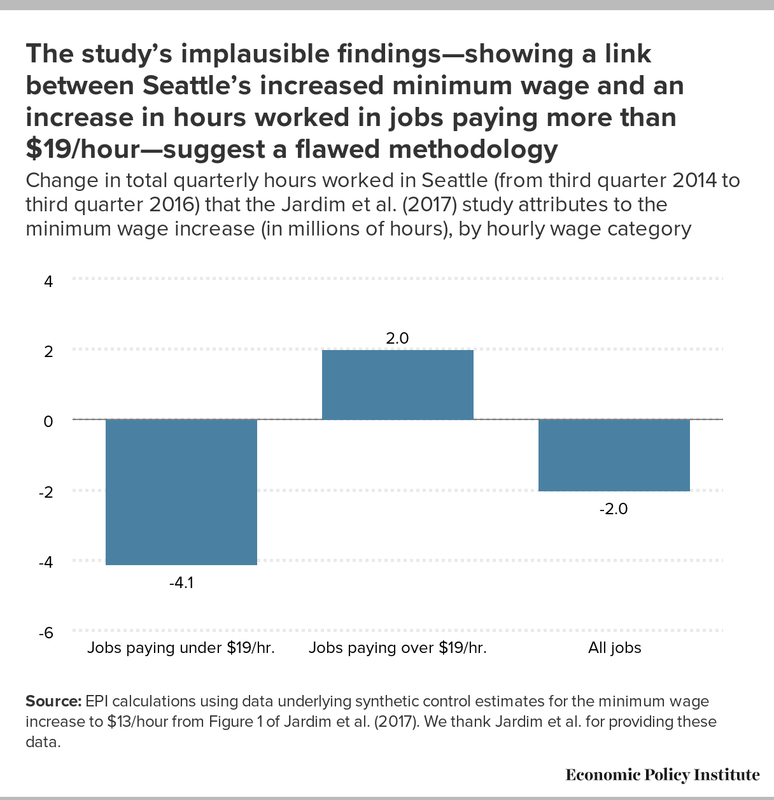 Our best explanation for the study’s outsized findings is that the statistical techniques employed were not capable of isolating the effects of the minimum wage from a range of other simultaneous changes in the Seattle labor market. In particular, the strong performance of the Seattle labor market in recent years appears to have overwhelmed the ability of the authors’ methodology to measure accurately the specific wage and employment impacts of the wage ordinance. The size of the employment losses estimated by the authors is much larger than those estimated in earlier research on the minimum wage—including research by consistent critics of the minimum wage (see, for example, Neumark and Wascher ). The authors argue that these large effects indicate that their study and results should be seen as an important new contribution to the large body of existing research on the minimum wage. But, these results, combined with other potential concerns about data and methodology, which we highlight in later sections of this paper, are instead better seen as substantial outliers that raise as many data and methodological questions as they answer. According to Jardim et al.’s calculations, a 1 percent increase in wages translates to a 3 percent reduction in employment. If correct, the authors’ results imply that, on net, the employment losses after the wage increase outweighed the wage benefits to those workers who saw their wages rise. The ratio of employment changes to wage changes is commonly called the elasticity of employment with respect to the wage, or the elasticity of labor demand. Jardim et al.’s results translate to an elasticity of about -3.0 (averaged over the estimates they provide for 2016 in their Table 8). All of the minimum wage research cited by Jardim et al., however, imply much smaller labor demand elasticities than found in the new study. One of the earliest papers cited by the authors, Card’s (1992) study of the 1990 federal minimum wage increase, found a very small band of positive and negative labor demand elasticities for teenagers, ranging from -0.06 to 0.19. In a recent study cited by Jardim et al., Dube, Lester, and Reich (2016) examined nearby counties with different minimum wages over the 2000–2011 time period and found labor demand elasticities of -0.27 for teenagers and -0.11 for restaurants. Even consistent critics of the minimum wage, as in the review by Neumark and Wascher (2008), estimate employment changes that imply elasticities of roughly -1.00 or smaller in magnitude (see the discussion in Allegretto et al. ). We also note that another recent study of the Seattle labor market’s response so far to the minimum wage ordinance finds estimates of the employment effect in the restaurant sector that are in line with earlier research and concludes that to date the minimum wage increases have had no negative impact on employment (Reich, Allegretto, and Godoey 2017). To rationalize their large disemployment effect estimates, Jardim et al. argue that they “analyze the impact of raising the minimum wage to a significantly higher level than what has been analyzed in most prior work.” In support of this claim, Jardim et al. compare the $13 minimum wage to the historical, nationally inflation-adjusted values of the federal minimum wage. But, this comparison is invalid: the relevant comparison is how Seattle’s new minimum wages compare to the city’s underlying wage distribution. In fact, the $13 Seattle minimum wage—which, again, does not apply to all workers in the city—lies within the range of increases evaluated in previous research. A common approximation for the strength of the minimum wage is the ratio of the minimum to the median hourly wage for individuals working full time, sometimes called the Kaitz index. Over the last 25 years, the overwhelming bulk of minimum-to-median wage ratios in local areas, such as counties, ranged between 32 and 55 percent (Zipperer 2016). This range of Kaitz indices comprises the evidence base for studies that find the minimum wage did little to reduce employment levels (Allegretto et al. 2017). Based on the average of 2015–2016 data for the Seattle-Bellevue-Everett metropolitan division, the median wage for all workers in Seattle was about $23.29 around the time of the increase to $13.00 (BLS various years). The median wage for full-time workers was likely at least 10 percent higher (as is the case nationally, where we have survey data on median wages for all workers and for full-time workers). As a result, Seattle increased its minimum wage to a Kaitz index of approximately 50.7 percent in 2016, still within the 32–55 percent range covered by earlier research. The authors’ estimated employment effects stand as outliers in a large body of research on the employment effects of the minimum wage. Rather than constituting an important new contribution to the research in this area, the findings are best seen as raising concerns about possible problems with their underlying data and statistical techniques. In the rest of this brief, we highlight several important data and methodological problems that likely account for the authors’ findings. The authors preferred estimates of the employment impact of the Seattle increases oddly concludes that the minimum wage caused a large growth in employment in jobs paying more than $19.00 per hour. Economic theory and the authors themselves, however, expect to find “negligible estimates at the highest wage rates.” The spurious higher-wage employment growth estimated by the authors is a telltale sign that their preferred statistical techniques have failed to control for Seattle’s booming economy. As a result, the authors mistakenly confuse a relative boost in high-wage employment—generated by factors unrelated to the minimum wage—for relative declines in low-wage employment which they incorrectly attribute to the Seattle ordinance. A key challenge the study needs to overcome is that during the period of the minimum wage increase, Seattle experienced dramatic employment growth in jobs paying above $19.00 per hour. Figure A—which uses the data on Seattle’s labor market presented in the study (see Table 3 in Jardim et al. )—shows that over the two-year period since the passage of the Seattle minimum wage increase, the number of jobs paying under $19.00 per hour fell by 8.5 percent. At the same time, higher-wage job growth soared: the number of jobs paying over $19.00 per hour grew by 21.2 percent, and, as a result, overall the Seattle labor market grew by 11.8 percent, much faster than the national average of 4.2 percent over the same two-year period. Of course, as some supporters of the ordinance have argued, the minimum wage increase in Seattle might be expected to help push the city onto a “high road” economic development path, thus explaining the big jump in employment above $19.00. But, the relatively small size of the wage increases under study so far (to $13.00 per hour, not yet to $15.00 per hour) and the relatively short duration of the increase (only 3 quarters since the increase to $13.00) mean that it is likely too soon to ascribe the large uptick in high-wage employment to the minimum wage increase. Moreover, the $13.00 minimum wage only applies to large employers that do not pay medical benefits, with minimum wages ranging from $10.50 to $12.50 in force for all other employers. Nevertheless, the same statistical methods that the authors use to conclude that the minimum wage is reducing low-wage employment also indicate—implausibly—that the minimum wage increase produced a boom in high-wage employment. Given that it is highly unlikely that an increase in the minimum wage to $13.00 an hour could cause a large increase in employment in jobs paying above $19.00 per hour, the finding of large employment increases in these jobs suggests that the authors’ preferred technique is either flawed or has been used in a context where the selected outside control group is not statistically valid. Jardim et al.’s methods also appear to estimate spurious higher-wage employment growth for the Seattle labor market overall. Figure C shows that the authors estimate large changes in the number of hours worked by higher-wage workers. Even after comparing Seattle with a supposedly appropriate control group, the authors’ methodology implies that the $13.00 minimum wage in Seattle increased the number of quarterly hours worked in jobs paying over $19.00 per hour by roughly 2 million hours. It is true that the authors find larger reductions in hours for jobs paying under $19.00 per hour, but instead of estimating that there are zero hours increases in the upper part of the wage distribution, their methodology mistakenly suggests that the minimum wage caused economically large increases in the number of hours worked by higher-paying jobs. Source: EPI calculations using data underlying synthetic control estimates for the minimum wage increase to $13/hour from Figure 1 of Jardim et al. (2017). We thank Jardim et al. for providing these data. In Jardim et al.’s Figure 1, which is the basis for our Figure C, they individually estimate the effect of the Seattle ordinance on the number of hours worked in $1 wage bins (the change in hours between $19.00 and $20.00, between $20.00 and $21.00 and so on). They argue that the individual effects in each of these $1 bins are “generally small” and statistically insignificant. But this inference is mistaken: they should instead be calculating the total cumulative effect on hours in jobs above $19.00, as in Figure C above, and assessing the statistical significance for the total number of hours above the threshold. Finding a sizable increase in hours where both we and the authors agree there should be “negligible estimates” casts doubts on the reliability of the study’s core methods and the resulting estimates. Standard practice in other empirical research on minimum wages is to reject methodologies that generate wage and employment effects in the higher parts of the wage distribution (see, for example, the paper by Cengiz et al. or the study by Autor, Manning, and Smith ). Finding large employment gains well above $19.00 per hour poses a serious problem for the credibility of this study. 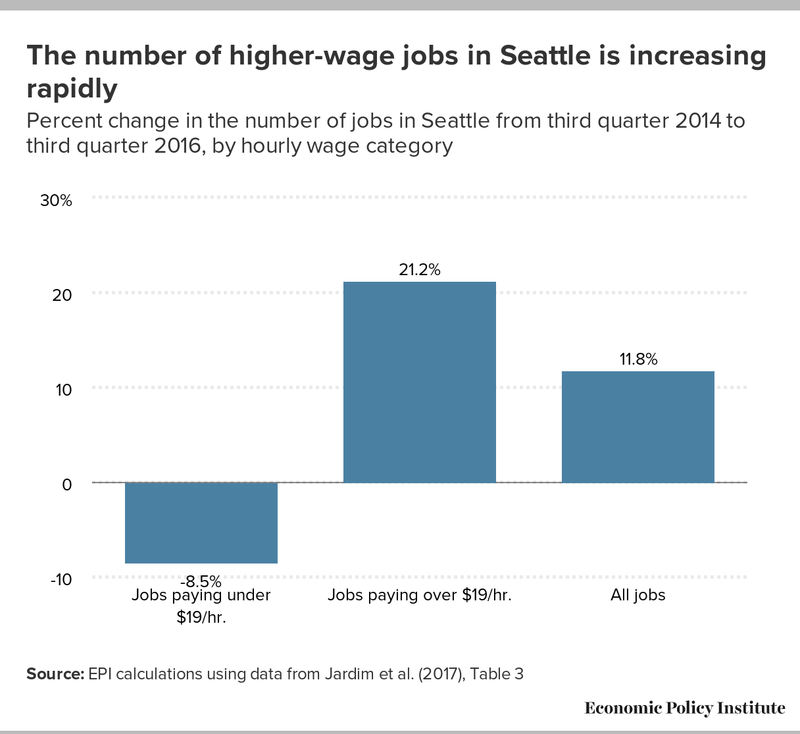 One possibility is that these higher-wage employment effects are real and that the minimum wage is dramatically shifting Seattle to a “high road” labor market where workers are employed at substantially higher wages. If this is the case, then the authors are overestimating the negative effects of the minimum wage increase on the Seattle labor market. The other possibility, which we are more inclined to presume to be the case, is that much of the higher-wage employment effect estimated by the authors is spurious. In this case, the authors are incorrectly attributing to the minimum wage a reduction in low-wage employment, when in fact there was a large shift in Seattle’s labor market toward higher-wage jobs that was happening regardless of the minimum wage increase. An additional piece of support in favor of this conclusion is that the authors do not find a “spike” in the number of hours worked at the new minimum wage. One consistent feature of wage distributions is the evident “spike” in the number of employees working at the minimum wage. Rather than a smooth distribution of workers at and above any statutory minimum wage, a regular feature of local, state, and federal minimum wages is that there are noticeably more workers who earn exactly any new minimum wage than there are just above the new minimum. This reflects the tendency of a new higher minimum wage to sweep workers who were below the new minimum just up to the new higher level, while leaving many (though not all) workers just above the minimum wage at or near where they were. In graphs of the wage distribution, this phenomenon creates a “spike” in employment at exactly the new minimum wage. The fact that, in their Figure 1, the authors fail to detect any new spike due to the minimum wage increase to $13.00, again suggests that the study is not estimating the true effects of the minimum wage and instead merely reflecting wage growth in Seattle that is occurring regardless of the the minimum wage increase. Data limitations require that Jardim et al. exclude from their analysis all employees at businesses in Washington that operate establishments at multiple locations in the state and report employment, hours, and earnings information jointly for those locations. In these cases, the authors cannot determine whether individual workers are at an establishment in Seattle—and therefore covered by the higher minimum wage—or are elsewhere in the state and, therefore, not covered by the new law. According to the authors’ calculations, this restriction excludes just under 40 percent (37.9 percent) of the overall workforce (likely many employees at chain stores and restaurant chains). The inability to track employees in multi-site businesses means that the study paints an incomplete picture of employment trends in Seattle and in the state as a whole. In particular, if the minimum wage shifts the composition of employment from single-location to multi-location establishments, the inability to track employment in these establishments will cause the authors to overstate negative employment effects of the policy. The idea that minimum wage increases change the composition of employers is not idle speculation. Recent research suggests that minimum wage increases do change the structure of the restaurant industry by affecting which firms go into and out of business. One recent study finds that, after a minimum wage increase, restaurants with lower customer ratings are more likely to go out of business, and another study finds that restaurant chains are both more likely to close restaurants and more likely open new establishments after a minimum wage increase (Luca and Luca 2017; Aaronson et al., forthcoming). Economic theory also suggests that the minimum wage could eliminate the lowest-paid jobs and replace them with jobs in higher-wage firms (Bontemps, Robin, and Van der Berg 1999); as a result, Jardim et al. will overstate the negative employment effects of the policy to the extent that higher-wage firms are larger and more likely to be multi-establishment firms. Failure to count jobs created in the large sector comprised of multi-location businesses therefore biases the study toward finding employment losses, even if the shift in employment to multi-location businesses more than made up for the drop in single-location businesses. The authors argue that excluding almost 40 percent of state employment from the analysis will likely have no effect on their findings. They cite results from a survey of 500 business owners before and after the minimum wage went into effect in Seattle. According to the survey, before the increase, multi-site employers were more likely than single-site employers to report that they intended to reduce employment in the wake of the Seattle ordinance and, after the increase, multi-site employers were more likely to report a reduction in employees. These qualitative reports of employer intentions before the increase and the retrospective, qualitative assessments of employer actions one year after the increase, however, are not a substitute for hard data on what these businesses actually did after the ordinance went into effect. And—what is at least as important—these qualitative reports on Seattle businesses tell us nothing about about the employment changes in the rest of Washington, the comparison group for this study’s estimates of the effects of the minimum wage. A better approach would be to use the longitudinal nature of their data to see whether or not the Seattle minimum wage increase led low-wage workers to shift from single-site to multi-site employers in greater shares than was the case elsewhere in Washington, where the minimum wage remained constant. Jardim et al.’s data allow them to follow individual workers through every quarter under study, including information on their employment status, employer industry, employer name, hourly wage, and total hours worked. If these data show a sizeable rise after the minimum wage increase in the share of workers moving from single-site to multi-site employers, this would be suggestive (though not a conclusive indication) that the Seattle increase simply shifted the composition of low-wage employment, on the margin, away from single-site and toward multi-site employers. Given that almost 40 percent of state employment is in multi-site businesses, the omission of multi-site employers is a major problem for the analysis. A common methodological check used in policy evaluations generally, and in minimum wage research in particular, is to investigate whether individuals or regions that were not affected by a given policy change appear to have responded—erroneously—to the policy change. If a statistical test shows that a policy affected a group that logically could not have been affected by the policy, then researchers generally conclude that the statistical test is invalid. A typical test of these “placebo effects” in the context of the minimum wage is to examine whether a given methodology finds employment effects well above the level where the minimum wage could reasonably have been expected to be changing wages. As discussed above in the discussion of higher-wage jobs, the study clearly fails this falsification test. Another common test investigates whether the methodology implies spurious wage and employment effects before the minimum wage increase actually went into effect, when again there should be no effects. This is sometimes called a test for pre-existing trends. In this case, the study does not provide sufficient evidence to rule out pre-existing trends. The authors do look to see if their statistical approach would erroneously find employment and wage changes in Seattle in the two years prior to the actual minimum increase, relative to a comparison group of areas in Washington (see their Table 4). Here the authors find mostly encouraging results for their preferred model (synthetic controls), but they still detect statistically significant—albeit small—wage increases in the year before the actual Seattle minimum wage increase, when there should be none. While rerunning their methodology on earlier data is a reasonable approach, it is inadequate because the methods used by the authors may end up selecting a somewhat different comparison group in this different sample of data than the one selected in the study’s baseline results and sample. The authors also fail to demonstrate that their preferred methods for calculating statistical significance are appropriate. They therefore risk concluding that there are statistically significant wage and employment effects when in fact there may be none. In the case of their comparison of Seattle with a “synthetic Seattle,” made up of a group of other areas in Washington state, the study should adopt the standard test in the paper by Abadie, Diamond, and Hainmueller (2010) (i.e., compare their treatment effect estimate to the actual tails of the empirical distribution derived in their placebo test, rather than assuming that the errors follow a normal distribution). In the case of their interactive fixed effects estimator, the authors should account for the fact that they have a single policy treatment affecting a single area. One approach would be to follow the procedures used in the study by Totty (2016). The authors could also evaluate whether these or their currently preferred methods for assigning statistical significance rule out wage and employment changes that occur by simple chance, by using earlier periods of their data when there was no minimum wage increase (since these changes also describe a distribution of wage and employment changes simply occurring by chance). The City Council and the residents of Seattle have assigned the authors of the study reviewed here with the task of assessing a broad range of economic effects of one of the country’s most important ongoing social policy experiments. To conduct that research, the authors have received public support and have been given access to confidential data not generally available to other researchers. Given the high stakes and the nature of this research, the University of Washington researchers have more than the usual responsibility to be responsive to data and methodological concerns raised by other researchers, city officials, and the residents of Seattle. The estimated size of the employment losses in the Seattle study lie well outside the range found in earlier research, including research conducted by consistent critics of the minimum wage. As our brief review indicates, the employment losses claimed in the Seattle study range from between two or three and roughly 10 times as large as the findings in the bulk of earlier research. While the nominal value of the minimum wage in Seattle is high by historical standards, Seattle was a relatively high-wage city even before the wage ordinance went into effect. Scaled to the city’s median wage level, the minimum wage increases have been comfortably within the range of national historical experience, which makes the authors’ very large estimated job losses suspect. In this brief analysis, we raise several data and methodological concerns that may help to explain why the study lies so far outside the range of earlier research. The fact that their methodology directly implies that the minimum wage increase in Seattle led to large increases in employment in jobs paying more than $19.00 per hour raises serious doubts about the validity of the statistical methods used. Most economists, including the authors of the Seattle study, believe that the minimum wage should have no discernible effect on high-wage employment (in the authors’ view, above $19.00 per hour), yet Jardim et al.’s preferred techniques find that the minimum wage substantially boosted high-wage employment in Seattle. While we certainly believe that the minimum wage can push a local economy onto the “high road,” we think these effects are more likely to be concentrated at wage levels near the new minimum wage and, in any event, are likely to take longer to work their way through the broader economy than the short period under study here. Finding employment growth at higher wage levels strongly suggests that the authors have failed to control for Seattle’s rapidly growing labor market, which is independently shifting the city towards higher-wage jobs, and which the authors’ methodology mistakenly interprets as a loss of low-wage jobs due to the minimum wage. Regardless of the mechanism underlying the authors’ findings, a well-designed test of the employment effects of the minimum wage should find no immediate employment impact at high-wage levels. The fact that the authors find that the minimum wage led to large increases in employment well above $19 per hour suggests that their methods are not well designed and are not capturing the true employment impact of the ordinance. One reason the study may be finding strong employment gains well above any plausible range where the minimum wage could be having an effect on employment is that Seattle was experiencing a labor market boom at the same time the city was implementing the minimum wage increase. Because the researchers have not constructed a statistically valid control group, their methodology was not able to factor out this independent change in the local labor market, calling into question the reliability of their parallel findings for low-wage workers. An additional piece of evidence in support of this explanation is that the study does not find a “spike” in the number of hours worked at the new minimum wage. A smoother distribution of wages is exactly what we would expect if the shift away from lower-wage jobs is simply reflecting ongoing wage growth in the Seattle labor market that is independent of the minimum wage increase. 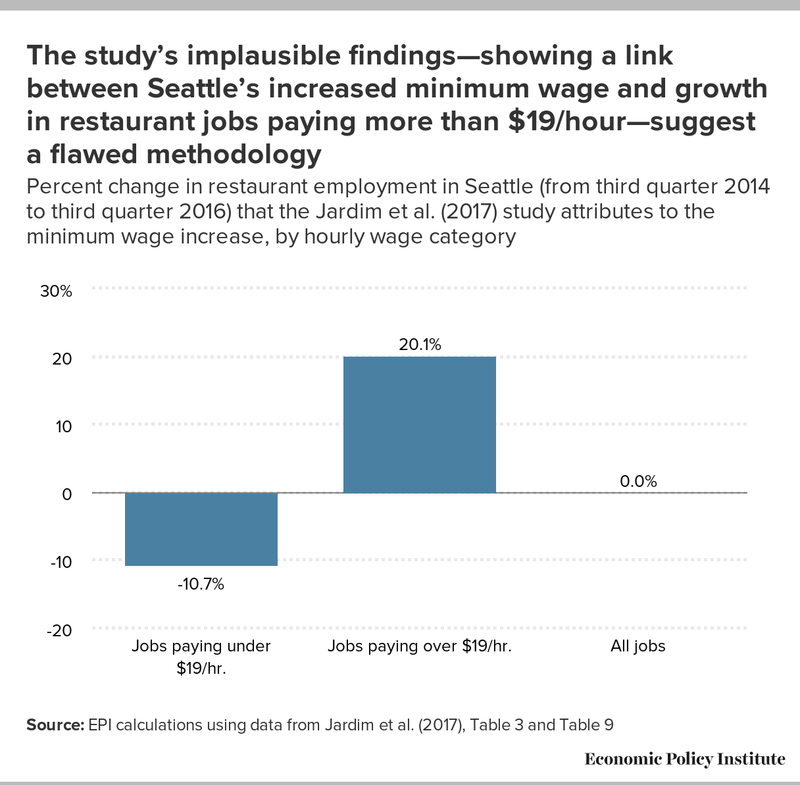 A second reason that the study may be biased toward finding job loss is that it excludes about 40 percent of total employment in the state, making it very difficult to draw meaningful conclusions about what actually happened to low-wage employment in Seattle. If multi-site employers captured the market share and—by extension—the employment that the authors believe was lost in single-site businesses, then overall employment in Seattle could have remained little changed after the wage increase, but the study’s methodology would still mistakenly estimate job losses in the city. The Jardim et al. study is one of many that the University of Washington team will produce on the Seattle minimum wage in coming years. Given the public trust granted—in the form of financial support and access to confidential data—the researchers have an obligation to address the concerns that we and other researchers raise about their data and methodology. Seattle and the rest of the country deserve to have the most accurate assessment possible of the economic impact of raising the minimum wage. 1. For some employers, the minimum wage requirements were lower—by between $0.50 and $2.50 per hour—than the headline figures of $11.00 and $13.00 per hour. The minimum wage phases in more slowly for small employers (with fewer than 500 employees); for small employers whose workers receive tips; and, for companies (large or small) that provide medical benefits. 2. For example, the authors should show the overlap of actual and synthetic Seattle throughout the entire pretreatment period, as in Figures 2 and 3 of the paper by Abadie, Diamond, and Hainmueller (2015); these figures are also reported in the synthetic control study of Seattle’s minimum wage by Reich, Allegretto, and Godoey (2017). The authors should also incorporate several years of leads of the policy treatment using the approach reported in Figures 10 and 11 of the study by Totty (2016). Aaronson, Daniel, Eric French, Isaac Sorkin, and Ted To. Forthcoming. “Industry Dynamics and the Minimum Wage: A Putty-Clay Approach.” International Economic Review. Abadie, Alberto, Alexis Diamond, and Jens Hainmueller. 2010. “Synthetic Control Methods for Comparative Case Studies: Estimating the Effect of California’s Tobacco Control Program.” Journal of the American Statistical Association vol. 105, no. 490, 493–505. Abadie, Alberto, Alexis Diamond, and Jens Hainmueller. 2015. “Comparative Politics and the Synthetic Control Method.” American Journal of Political Science vol. 59, no. 2, 495–510. Allegretto, Sylvia, Arindrajit Dube, Michael Reich, and Ben Zipperer. 2017. “Credible Research Designs For Minimum Wage Studies: A Response to Neumark, Salas, and Wascher.” ILR Review vol. 70, no. 3. Autor, David H., Alan Manning, and Christopher L. Smith. 2016. “The Contribution of the Minimum Wage to US Wage Inequality over Three Decades: A Reassessment.” American Economic Journal: Applied Economics vol. 8, no. 1, 58–99. Bontemps, Christian, Jean-Marc Robin, and Gerard J. Van den Berg. 1999. “An Empirical Equilibrium Job Search Model with Search on the Job and Heterogeneous Workers and Firms.” International Economic Review vol. 40, no. 4, 1039–74. Bureau of Labor Statistics (BLS). Various years. Occupational Employment Statistics [data sets]. United States Department of Labor. Card, David. 1992. “Using Regional Variation in Wages to Measure the Effects of the Federal Minimum Wage.” ILR Review vol. 46, no. 1. Cengiz, Doruk, Arindrajit Dube, Attila Lindner, and Ben Zipperer. 2017. “The Effect of Minimum Wages on the Total Number of Jobs: Evidence from the United States Using a Bunching Estimator.” Paper presented at the Society of Labor Economists 2017 Annual Meeting. Dube, Arindrajit, T. William Lester, and Michael Reich. 2016. “Minimum Wage Shocks, Employment Flows, and Labor Market Frictions.” Journal of Labor Economics vol. 34, no. 3. Luca, Dara Lee, and Michael Luca. 2017. “Survival of the Fittest: The Impact of the Minimum Wage on Firm Exit.” Harvard Business School Working Paper 17-088. Neumark, David, and William L. Wascher. 2008. Minimum Wages. Cambridge, Mass. : MIT Press. Reich, Michael, Sylvia Allegretto, and Anna Godoey. 2017. Seattle’s Minimum Wage Experience 2015–16. Center on Wage and Employment Dynamics Policy Brief. Totty, Evan. 2016. “The Effect of Minimum Wages on Employment: A Factor Model Approach.” Working paper. Zipperer. 2016. “History Shows Why New Hampshire Has Room for Higher Minimum Wages.” Equitablog (Washington Center for Equitable Growth).